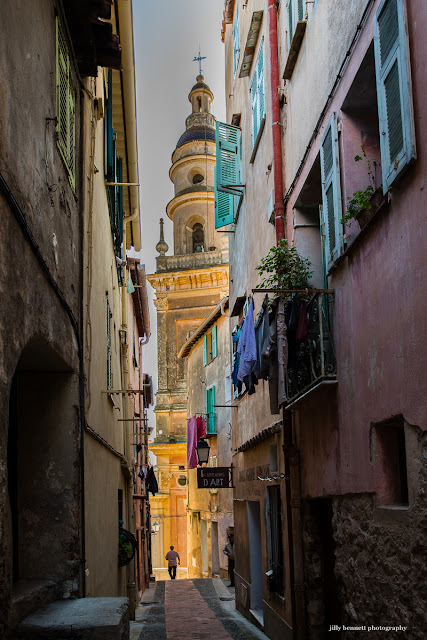 A glimpse of Menton's Basilica Saint Michel. Un aperçu de la basilique Saint-Michel de Menton. Beautiful photo, I love the angle! A beautiful structure. It looks imposing from this angle. This is where my Mom was baptized 82 years ago. We were in Menton 3 years ago and we were supposed to meet you Jilly. But there were so many cousins to visit. Perhaps our next visit. This must be beautifully lit at night when exiting this rue. Well caught when the light was just right!